Ready Player One Gets First Image | Nerd Much? We’ve finally got the first image for Steven Spielberg’s much awaited film Ready Player One. It shows actor Tye Sheridan, as main character Wade Watts, trying out the all new (fictional) Oasis VR. Though the world is set in 2045, the Oasis brings players back to the 80s. Everything good about the 80s, of course, none of the political or social turmoil at the time. The photo certainly reveals a lot of clues about the film, if you haven’t already read the book the film is adapted from. The book, also titled Ready Player One is penned by Ernest Cline, just in case you want to zip over to Amazon and order it. In the day and age of Wade Watts, haptic feedback gloves are apparently more affordable then they are now, but not the vests. There also seems to be either a speaker around his neck, or something that will work like Ubisoft’s Nosulus. He also appears to be strapped around the waist to a stand behind him, which I assume carries the motion capture camera. A lot like the HTC Vive’s set up, except you can apparently jerry-rig it yourself. In an interview with Entertainment Weekly, author Cline states that if he “hadn’t grown up on a steady diet of” Spielberg’s movies, he wouldn’t be the writer he is today. He even goes on to say that Spielberg’s work directly affected the narrative of Ready Player One and the way he wrote the story. To have Spielberg directing the movie adaptation is apparently beyond perfect, but “somehow it’s happened” anyway. 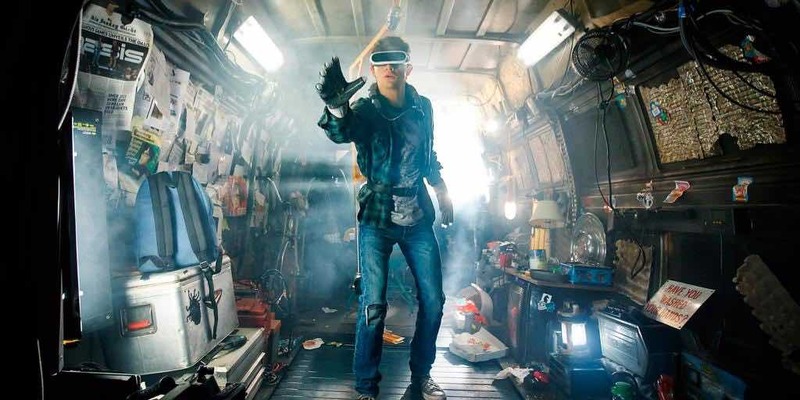 Ready Player One certainly sounds like a world Spielberg will enjoy playing in. The film release March 18, 2018.